This ayurvedic confectionery is made following the original recipe, using ghee instead of butter. 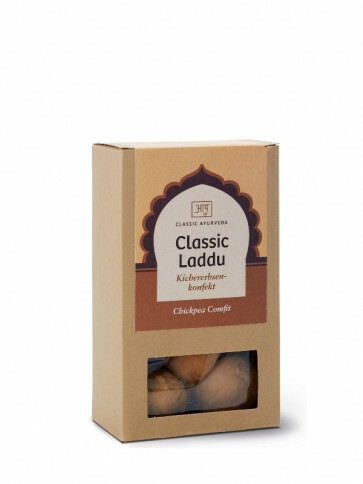 The traditional ayurvedic name for laddu is modak - a preparation that gives joy to the inner body. It was traditionally given to people making a pilgrimage. On reaching a holy place the pilgrims were given laddu quickly to restore physical energy and to strengthen the mind for meditation and prayer. Ayurveda considers laddu to be especially effective in promoting digestive fire, jathar-agni. Roasted chickpeas are an excellent source of protein, especially for children and for mothers who are breast-feeding. They are a good source of plant protein for vegetarians.